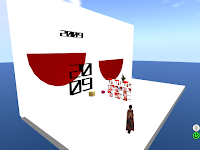 Mikati Slade in Second Life [Mi]: Happy New Year 2009! In japan, new year 3days are important days with tradition that called "Oshougatsu". I made above pic only at SL, yes, this is a snapshot without any works on graphics app. I built this "photo studio" at a sandbox. Letters made by reguler prims and I attached it to HUD when taking snapshot. Happy New Year to you too Mikati :) Your pics look amazing! This is a perfect New Year's card. A font is good, too, and a kimono becomes you, too.